For a movie that introduced the world to Jared Leto’s scowling, slimy, forehead tattoo-having Joker, David Ayer’s Suicide Squad was shockingly dull. It was too gloomy and gritty for its own good, especially considering its supposed to be about a ragtag group of weird DC Comics villains like Captain Boomerang and Killer Croc. The movie was never going to be Guardians Of The Galaxy (though the next one might), but it sounds like it might’ve at least been a little wilder if Warner Bros.’ plans for the then-upcoming Justice League movie hadn’t eaten its lunch. This comes from Ayer’s Twitter account, on which he recently addressed some fan questions about Suicide Squad concept art that seemed to show some Parademons and New Gods bad guy Steppenwolf. This implied that Suicide Squad may have once been tied to Apokolips and Darkseid, who is essentially the main villain of the whole DC Universe—and the guy that Batman V Superman: Dawn Of Justice foreshadowed the arrival of. 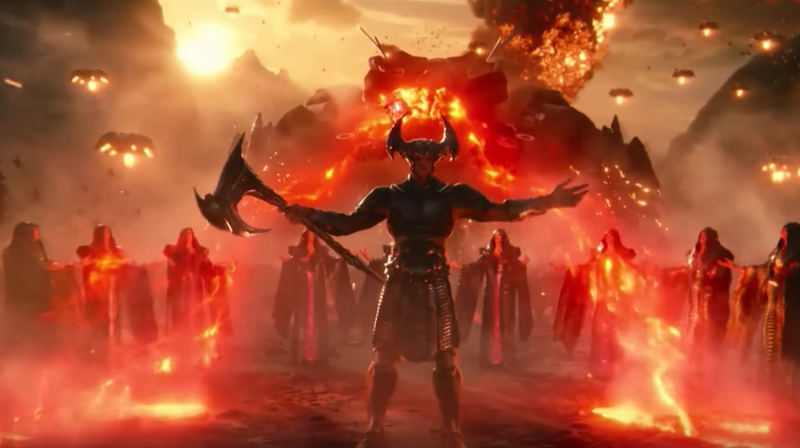 Steppenwolf, of course, actually appeared with his army of Parademons as the overly tall (and also shocking dull) baddie in Justice League, which came out after Suicide Squad. Ayer confirmed that the images were real, explaining that one version of the Suicide Squad script involved Cara Delevigne’s Enchantress being possessed by Steppenwolf to prepare for an invasion of Earth, setting up what was eventually the Justice League story a while before Justice League actually did it. He even notes that they had to change his movie when the plans for Justice League “evolved,” implying that WB decided to save Steppenwolf for Justice League and leave Suicide Squad to focus on Enchantress’s brother Incubus (a largely generic evil dude) and some boring goop monsters in place of the Parademons. This would’ve made Suicide Squad a slightly more interesting movie, if only because it would’ve set Justice League up for a more interesting fight—like, say, against Darkseid himself. Of course, Warner Bros.’ whole recent history of DC movies is littered with things that could’ve or should’ve worked out better than they did, so maybe we should just accept the movies we got and hope for some eventual reboots.